WITH such a minefield of information on menopausal treatments, Dr Heather Currie has produced a website, which she regularly up-dates. Increasing numbers have been clicking on in recent months to ease concerns about the controversy surrounding HRT and its links with breast cancer. HRT stands for Hormone Replacement Therapy, which is designed to counteract with effects of reduced oestrogen levels. There are 40 types of HRT product on the market, mainly consisting of natural, low does oestrogen. They can be taken as a daily tablet, a weekly or twice weekly patch, daily gel, nasal spray*, vaginal cream or six month implant. And for some women it helps control apparent symptoms such as bladder problems, vaginal dryness, dry skin to thinning hair. It can also prevent bone loss and reduce the risk of fractures with woman at risk of osteoporosis. Current opinion is that HRT taken for less than five years does not significantly increase the risk of breast cancer. However, if taken for more than five years, there appears to be a small risk. For example, for women aged 50 to 70, breast cancer is thought to affect 45 per 1000. If taken for more than five years, this increases to 47 per 1000. Research also shows that HRT has been shown to cause a small increased risk of clotting, for example, deep vein thrombosis. 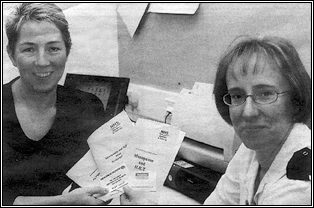 Dr Currie said: "It is vital that women know as much as possible about the menopause so they can get the best treatments that suit them "HRT has brought many significant benefits to women for relief of distressing symptoms while others not so good. "We are aware it is not perfect but it is fair to say the risks have been exaggerated. "The vast majority of women who take HRT do no have troublesome side effects but for those who do, adjustments can be made and many different treatment options are available."